This subject comes up from time to time, and VTphotog suggested a sticky post about it. So, I've added this one to the announcements posts you'll find at the top of the threads list in this forum. If you want to use an external flash (other than what the camera manufacturer recommends for your camera model), it's best to find out what it's trigger voltage is, and what the camera manufacturer's specifications for the hotshoe allows for a maximum trigger voltage to prevent damage to the camera's electronics. Note that the maximum trigger voltage allowed for a hotshoe may be very different compared to what a camera allows via a PC Sync port. Some manufacturers don't publish information on the maximum trigger voltage allowed. But, I've seen it reported that KM and Sony models have a hotshoe that is expecting trigger voltage at TTL Level. So, it's best to stay at around 6 volts with them. The same applies to Canon models (it's best to stay with a flash that has a lower trigger voltage). It's my understanding that Nikon DSLR models have a hotshoe rated at up to 250 volts. If you've asked a manufacturer about trigger voltage limits and received a reply, feel free to post it to this thread. If you have an older model flash with a higher trigger voltage and want to be safer mounting it in your camera's hotshoe, there are adapters available that can reduce the trigger voltage seen by the camera. One such device is the Wein Safe Sync. The Wein Safe-Sync Hot Shoe to Hot Shoe (SSHSHS) regulates and reduces the flash sync voltage of the flash from up to 400V to less than 6V. This is especially important for current automated SLRs or digital cameras when used with older flashes or lighting systems. 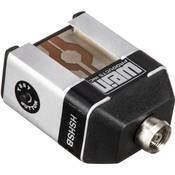 This model mounts directly to a camera's hot shoe and provides a hot shoe on top and a PC female flash connection on the side. You can have a flash connected to the hot shoe and a flash being triggered by the PC female connection-and unlike so many other offerings of this type, both will fire simultaneously from the same signal. Paramount http://www.paramountcords.com/vp.asp also makes a range of sync cords with in-line voltage filters. A bit of know how and you can make a safe sync very cheaply. Paramount cords show one for a studio flash, which is easier still to make. I asked this question with appropriately named therad but did not get any replies. Since you guys seem to know somthing about using one dedicated flash with another camera, can you please tell me if it is possible to Use Nikon SB600 flash with My Panasonic FZ20? liketaking Macro photographs and previously used a Starblitz 1000 macro ringflash on my Minolta 800si film SLR without any problems. However - I have just bought a Pentax K10D and tried to use the Starblitz ring flash after attaching a hotshoe adapter with PC Sync to the camera. The result being the flash does not fire :sad:. A friend brought along an old Minolta flash gun, I attached this to the PC Sync adpater and it fired. So I measured the trigger voltage on both flash guns. The StarBlitz was measuring 3.5 V whilst the Minolta measured 40 V.
Is it possible that the voltage of the StarBlitz is too low for the Pentax K10D circuitry to detect and thus it does not fire? I did click on the link provided on this topic and found the flash gun I use, and someone stated it had a trigger voltage of 6.8V, could it be that my flashgun is faulty? See if it will fire when you short between the center pin and outside of the flash foot (and/or see if it still fires on a different camera). If not, the flash is probably defective. If it will fire when you complete the circuit between the center pin and outside of the foot, then the flash is working and you've got a compatibility issue with the camera (for example, it may not be closing the circuit long enough for the flash to recognize it and fire). Thetrigger voltage in the flashgun is shorted to ground by the camera putting a negative going voltage spike in the trigger transformer.I have used 2.5-3v with no bother. Thing seem to getting a bit better nowadays. Canon 5D say you can put up to 250v on the PC terminal, but not on the hotshoe. The leaders in this are Fuji have always said up to 400v on their cameras. Now that rings a bell, 400v is the max volts for most SCR`s.